House speaker is furious at plan to protect Northwest forests. 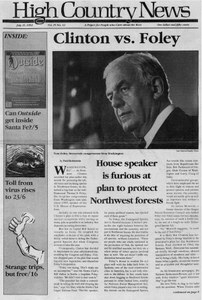 As President Clinton unveils his plan for protecting the old trees and declining species in Northwest forests, he disturbed a big bear on the trail: Democrat Thomas S. Foley, the longtime congressman from Washington state. Tips for hitchhiking in the West.